Winter in the mountains we call home can feel long, and the spring can feel like not much of a thaw at all. At the risk of jinxing it… the warmer temperatures are here to stay for this year, so it’s time to consider a weekend trip with the family. If you call Vernon home, you’re in luck. Being at the centre of mountain living in British Columbia we’re cursed with too many options for weekend activities. It can be hard to narrow down, so we’ve done the research for you. All that’s left to do is drive and enjoy the opportunities the area has to offer. Weekdays can be hard, so why shouldn’t weekends be easy? Just a little over two hours from downtown Vernon you’ll find one of the many Revelstoke hot pools that have made the area famous. Located in the Canyon Hot Springs, just twenty-five minutes from Revelstoke’s historic downtown, come to relax in the naturally fed mineral pools that might be able to wash away all your worries from the week. Feeling like you need to work up a sweat before you’ve earned a soak? 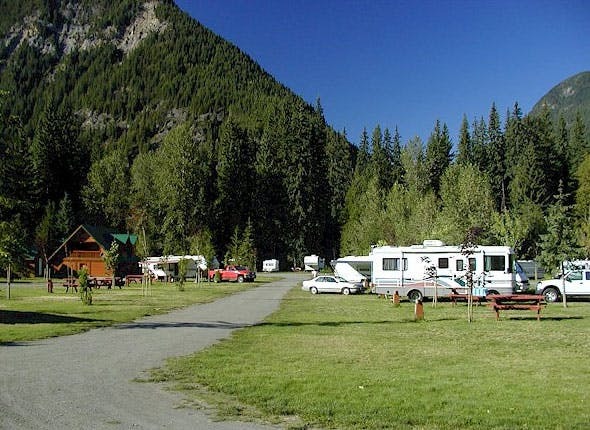 Take a hike on some of the trails around the springs and explore the area nestled between Glacier and Revelstoke National Park. And if you need a little more excitement before your relaxation take a walk on the suspension bridge that will leave you alongside a waterfall. Gives new meaning to noisy neighbors! Open 9am -8am all summer long. For any further enquiries call 1 (250) 837-2420. Had a boring week? Then maybe it’s time for an exciting weekend! The cure you seek for your weekday doldrums is only three and a half hours away. Check out one of British Columbia’s most powerful animals in its natural habitat, the Grizzly Bear. And not just any bear, but Boo the bear. Boo calls the Kicking Horse Mountain Resort Bear Sanctuary home after being orphaned as a cub. Fortunately Boo hasn’t had it too bad since then taking up residence in the largest protected and enclosed Grizzly Bear habitat in the world. Come see this powerful giant of the mountains in its natural environment. As scary as they are, it’s important to learn that bears have a lot to be scared of too. Through interpretive tours learn about the dangers and threats the shrinking bear population faces. Learning about the environment and the impact our lives have on it gives us all a better appreciation for it. Whatever you decide, take some time this weekend or next to explore the beautiful province we call home. Hit the road and make memories your family will remember for years to come… but be sure to get your oil changed before you do!